This sofa is everything we wanted and more. We just downsized to a smaller home and have no den/family room. Our goal was a comfortable, multi-seat sofa that was sleek enough for our living room. This is it! It is smaller than the majority of sectionals so it does not overwhelm the room and the neutral color is so rich looking. It is 100% leather including the back being fully finished. This sectional is firm and very comfortable. It's large and spacious but unassuming in our family room. I brought this sectional in the chocolate brown color during the Christmas holiday season 2014 and it is beautiful. It looks so nice in my living room and is very comfortable. I am very, very pleased with it. I can't wait to get the ottoman to match. And the fact that it is all leather and not bonded leather (which I don't really know what bonded leather actually is) makes it all the more better. Definitely worth the money! There is nothing not to like about this sofa. The taupe color is beautiful, The leather is really nice and soft and the best part is that is comfortable. Only time will tell how it wears but it seems to be very well made. If you get it on sale it is even better. Fell in love with this set the minute I saw it!! Love the leather in the comfortable quality. We have college kids as well as a dog. We needed something durable as well as a classy look! Can't say enough, except love our choice for quality!! This sectional sofa is just great. It is super comfortable , super cozy, and the color is unique. After having this a few years I love it even more. The leather is holding up so well, still fells like new and has been well used. No fading at all ( which I was surprised) because sometimes it takes direct sunlight. One of the best furniture purchases I have ever made. firm but very comfortable, looks great!! The Garrison 2pc sectional fit nicely in our living room. The leather finish gives this firm but comfortable multi seating sofa a luxurious feel yet provides the casual look we were going for. I also like that the back pillows and seat cushions are attached to the frame; no more pillows being lost behind the seat cushions. I would recommend purchasing the coordinating ottoman. Not only does it afford additional seating, it also is a nice place to prop up your feet at the end of the day. We purchased the sofa in the taupe color and the ottoman in the chocolate brown which clearly defines the two pieces. We are very pleased. we bought this Garrison 2-pc sofa. leather Sectional Sofa in 2014. it is ideal to look in our living room. The sofa is very comfortable. The elastic cushions are comfortable for my aching back. the leather sofa is of excellent quality. after 4 years it looks like a new one We are very satisfied with the purchase. we will buy in furniture only in the store Raymour&Flanigan Thanks a lot staff for services!!! This sectional really delivers...comfortable & looks so chic. Nice quality leather. Great experience with sales dept and delivery staff; had it in our home within 48 hours! Amazing comfortable sectional sofa. The leather is very comfortable and easy to clean. The chase is big enough for a person to sleep . I was doubtful weather it will fit in my small space but it perfectly fits. I believe it’s sleek sofa for space saving and comfy. I bought this sofa and I am very happy with it. Quality leather, comfortable and it looks beautiful. I am very happy with this purchase. Customer service was excellent. Delivery on time with professional staff delivery men. Excellent and very comfortable. The color is very pretty . The couch is the perfect shape and a neutral color that fits any decor. As for the quality of the couch it has yet to be tested. The cushions are hard. I read many reviews after purchase about the couch peeling and I am trying to be optimistically cautious. Is it made from top-grain leather or split grain? Or both? BEST ANSWER: The Garrison is made of 100% genuine leather. An Ecommerce Assistant Manager confirmed this is split grain leather, not top grain. BEST ANSWER: The Garrison collection is made in China. does the cushions come off? BEST ANSWER: The cushions are attached. Attached seat and back cushions provide a clean, neatly tailored look. Does this sectional slide (and potentially scratch) on hardwood floor? What padding is under the wooden feet? If I used area rug (with pad), would it be OK to have just the front feet on the rug or should all feet be on the rug? BEST ANSWER: The feet scratch hardwood floor when dirt gets between the wooden feet and floor. The sectional does slide when people sit on it. I would suggest using a rug under the front feet with padding under the rug to keep it from sliding. Place padding or floor protectors under back feet. Hope this helps. This is an exceptionally heavy piece of furniture and doesn't slide easily - having said that, I have had to physically move it to retrieve dog toys and no, it doesn't scratch my wood floors....your choice on the rug placement, but mine isn't on the area rug at all. It has small rounded plastic padding under the wooden feet. It does slide if push but it hasn’t scratch my floor. Front feet on a rug would definitely make it more difficult for it to slide. We have ours on an area rug. The wood feet do have protectors on them and the furniture is very heavy so I don’t think it would slide on hardwood floors. Couch is really so beautiful. We have area rug on front feet, wood floor on back feet. No scratching need!! It does slide fine when needed but not moved very much. Couch in on wooden preigo type flooring. It has wooden feet so yes it could scratch your wooden floors. The wooden feet are all different shapes.Which one goes where? BEST ANSWER: There are going to be two curved legs that will go on the end of the right arm facing sofa. The two 5" x 8" legs are to go on the front of the chaise. And the remaining 2" x 8" legs are to go in the front corner, back corner, and back where the sofa and chaise go together. what is the length of the 3 seat sofa and the right arm section separately? It wasn t 'clear from dimensions online info. Also what is the width of each piece? 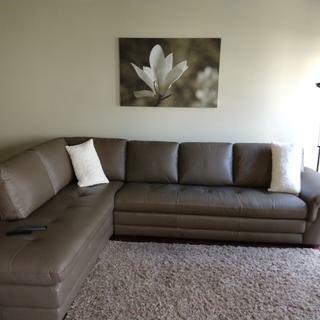 Is this sectional no longer available in dark brown? BEST ANSWER: Hello Rosalyn, thank you for your interest in the Garrison 2-pc. sectional sofa! The color, Dark Brown, is no longer available for purchase. We do offer other dark brown leather sectionals. I have attached a few items to this post! I already own this couch , my dog ripped the lounge section is there a way to only order that part of the sectional ? BEST ANSWER: Hello Stephanie, we're very sorry to hear about this! For assistance, please contact our customer care department at 866.383.4484, option 7. We would be happy to help you! Is depth of the seat enough for tall or heavy folks? BEST ANSWER: The seat depth is 21.5" and the seat height is 18". We would be happy to assist with finding you a sectional thats comfortable and that fits your needs. A home furnishings consultant will reach out to you shortly! 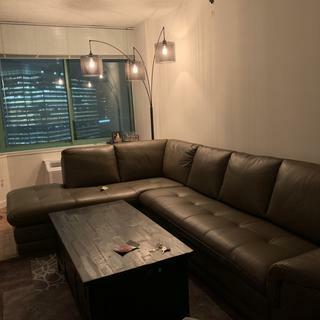 Looking for a leather sectional with about 23 inches seat depth .. any suggestions ? 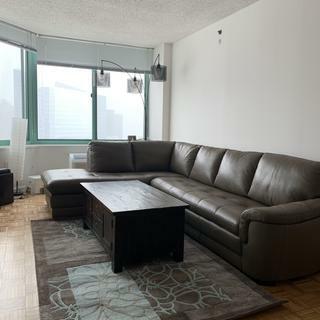 would the Left-Arm-Facing Chaise be placed to the right ? BEST ANSWER: The Left-Arm-Facing Chaise will be placed on the left when standing in front of and facing the sectional. What size rug should I get for this sectional? BEST ANSWER: A rug the size of 8' X 11" or 10' X 13' would work well with this sectional. Can this be made in red? BEST ANSWER: The Garrison collection is available in Taupe or Dark Brown colors only. Is it made with bonded leather or Genuine leather? is this product in the store to go look at.I live in northeast philadelphia.